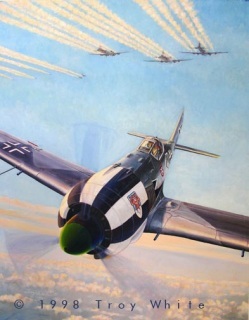 Hauptman Hans Ehlers, Gruppenkommandeur of I./JG 1, flies head on through a formation of B-17s in the spring of 1943. 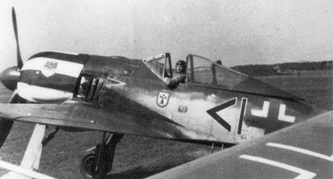 During that time period JG 1 painted the cowls of their Focke Wulf fighters with black and white stripes or checkerboards for easy recognition during combat. Ehlers was credited with 54 victories, including 20 4-engined bombers. During the Ardennes offensive JG 1 found itself providing air cover for German forces on the ground. 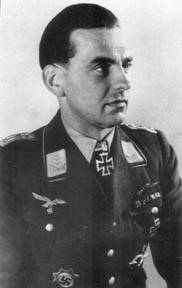 On 27 December 1944 Ehlers was shot down and killed by Mustangs of the 364th FG east of Mayen. At the time of his death he was flying an FW 190A-8 "White 20".